Treadmill Ratings Reviews / Blog / Blog / Can Running Make You Happier With Life? Can Running Make You Happier With Life? Stacey of Idaho Falls felt that she needed a change in her life. She was unhappy with the reflection in the mirror and concerned for her future self. “I was starting down a path to obesity unless I made some changes in how I ate and my level of physical activity,” she shared. When a friend suggested she started to run, Stacey decided to give it a try. At first, it was a struggle. “I was amazingly out of shape and even running half a mile was tough.” Over time, she learned to budget her time for runs, find the correct motivation (great food at the end of the run), and surround herself with encouraging people. 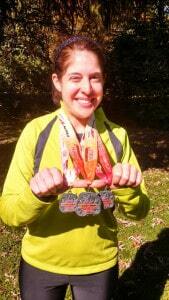 Stacey displaying medals from her first ‘hat trick’ – a 5K, 10K, and Half Marathon all in the same weekend in October 2013. A new lifelong runner was born! Today, Stacey regularly competes in various types of races in locations across the country. “I try to sign up for at least one half marathon a year, plus 5Ks and 10Ks that either fit into my plan are for a good cause,” she explained. 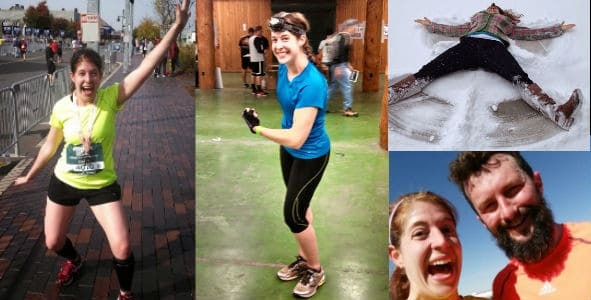 Stacey especially enjoys running fun races like one that took her up the slope of a volcano, a Pi Day Pi K, and even a February Cupid Underwear run to benefit pediatric cancer (in frigid Pittsburgh no less!) She likes races where she can be with great people, see fun sights, and drink a good beer at the end. Her fitness routine involves training six days of the week including: 4-5 miles on Monday, a 1-3 mile run to the gym for weight training on Tuesday, a speed workout of 3-5 miles on Wednesday, another run to the gym on Thursday, a longer run of 6-12 miles on Friday, and hiking 6-12 miles over the weekend. She is much happier with life. What Do the Scientists Say on the Matter? So, the question remains – can running make you happier with life? The happiness that results from a consistent exercise plan like running is not just in Stacey’s head – it’s supported by science. Multiple scientific studies support the notion that running makes people happier. Pain Journal published a double blind study of twelve long distance runners that concluded that long-distance running produces hypoalgesia (a decrease in pain sensitivity) and causes mood elevation in men. An article in Behavioral Therapy1 explained how one researcher used aerobic exercise like running to serve as a treatment for depression in women. There was a “significant decrease in levels of measured depression” in the subjects. Another article in the Journal of Personal and Social Psychology2 also tested 43 college women and showed “significantly more improvement in depression scores” during their study. Stacey is loving life now that she’s become a runner. 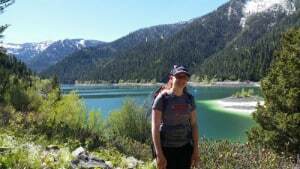 This is a photo of her at Upper Palisades Lake during one of her weekend hikes. It is important to select the right type of treadmill for your body and budget, so it is always a good idea to look at reviews for the best treadmills before you make your purchase. Now go for a run and be happy! Do you want to learn more about long distance running? Check out our guide to Ultra-Marathons. What were some of your challenges when you started running and how did you overcome them? How has running had a positive effect on your mood and life outlook? DOYNE EJ, CHAMBLESS DL, BEUTLER LE. Aerobic exercise as a treatment for depression in women. Behav Ther 1983; 14: 434-440. MCCANN IL, HOLMES DS. Influence of aerobic exercise on depression. J Person Soc Psychol 1984; 46: 1142-1147.